Comments: Whooping Cranes are listed as an endangered species throughout the Great Plains. From an estimated 1,300 individuals in the 1860s, numbers dropped to less than 20 in the 1940s. Conservation measures, including captive rearing and release, have increased the wild population to about 300 birds. The primary flock breeds in Wood Buffalo National Park, Alberta and winters 2,500 miles to the south at Aransas National Wildlife Refuge, Texas. The birds migrate through the Great Plains along a narrow 100-mile wide route through cropland, shallow wetlands and wide, shallow rivers. Whooping Cranes are usually seen in late March to mid-April and from mid-September to mid-November. They usually migrate in family groups or small flocks, fly with their necks and gray-black legs held straight out and show black wing tips. Immature birds show varying amount of white and cinnamon-colored feathers. Several white-plumaged species, including geese, swans, pelicans and egrets, are often misidentified as Whooping Cranes. 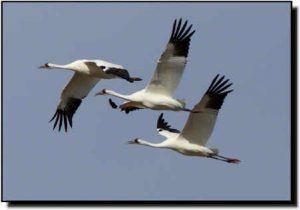 Lack of winter food resources, severe weather, pollution and collisions with powerlines all threaten Whooping Cranes.